Some years ago, I had planned a trip to Virginia Beach and began to seek out coffee, only to find little in the vicinity. For other logistical reasons, the trip didn't end up working out and I lost little sleep knowing I had not missed out on great coffee stops. Then just recently, the trip resurfaced and this time, I had a little more fortune in finding a coffeehouse worth visiting. Of my suspects, one of the few that showed the greater potential was a place called Cafe Moka. Located in a strip mall of sorts with large reflective windows, Cafe Moka had a lot of tell-tale signs of quality. A quick visual scan upon first entering confirmed a lot of hunches, chief of them being a menu that offers various brew options including chemex, aeropress and siphon. To boot, the interior was well-designed, with an airy, tranquil decor of white, brown, orange and brick, all of which surrounded the long wooden floor that cradled the numerous patrons buzzing away at their tables. Ready to put rubber and road together, I went to secure my coffee. Sadly, they don't publicize who roasts their coffee (poor guy/girl), stating it comes from a private roaster. After some banter on which method and which coffee they recommended, I decided upon an espresso of their espresso blend and a Chemex of their Kenya. The espresso, a medium-volume pull with brown crema served in a glass tumbler, gave off notes of wheat thin, dark cocoa, chianti, light cream and pepper, proving to be a dry concoction, with slight bitter notes and a mellow sweetness (aka pretty good). The Kenyan inversely proved a lot brighter and refreshing, with hefeweizen, fuji apple, caramel popcorn, sea salt and a touch of roast chicken amidst a light body, making for a delicious punch of fruit and wheat. All together, Cafe Moka proved to be a great stop. Sure my espresso was a touch darker than I would have liked and I find secret roasters a pet peeve (I like to know who I am drinking), but both were negligible in the fact that the place boasted some skill, some quality brew and a really nice space to unwind or work. 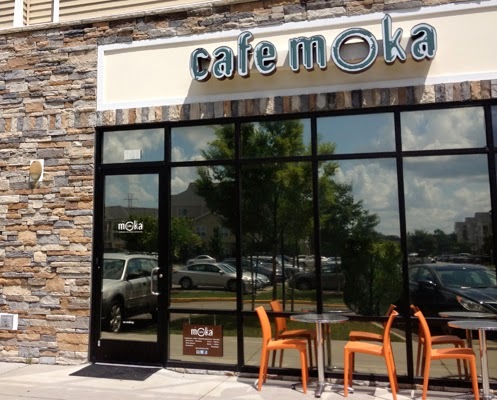 If you happen to be in Virginia Beach, definitely give Cafe Moka a stop. Kind of a surprise to have that strong of a coffee, huh? I like the heavy stuff but that can be a bit of a workout sometimes. The real strong single cup coffee can pack a wallop.